Camden New Journal - Sports: We finally beat the Gunners! We finally beat the Gunners! It’s the day after the night before and I’ve just bought the biggest cream cake I can find, because it feels like my birthday. And Christmas. And May Day. All rolled into one. Pundits say it is hard to predict a derby, but games between us lot and them lot had conformed to a pattern in recent years. Spurs turn up, have a go, but then by some tragic twist, muck it up. Not this time: Spurs are on their way to Wembley. Forget any nonsense about it only being the Carling Cup, this is Spurs versus Arsenal, a game no side wants to lose. Especially 5-1. Hard to consider in the cold light of day how it happened: I’m feeling too emotional for that. But according to my notes, Jermaine Jenas, who opened the scoring after only three minutes, put in his finest performance in a Spurs shirt. When Spurs where not in possession, he never gave up lost causes. When we had the ball, he became a graceful ballerina, pirouetting past tackles and spraying the passes. Jenas was given a platform to perform by the tigerish tackling of Teemu Tainio. The Finn, so often overlooked, gave a perfect example of football’s dark arts. He was the rock upon which Arsenal’s attacks foundered. But to single out one of 14 super heroes would be unfair. Our rivals had spells, moments, where they began to flow forward, but there was a hungry, snapping team in white to get past first. Yet heading off for a pie at half-time with a two goal cushion after a Nicklas Bendtner own-goal blunder, I still didn’t feel safe. After refreshments, I returned to my row ahead of my neighbour, a fellow Spurs reporter, and was about to take his seat so he wouldn’t have to squeeze past me. I was told in no uncertain terms not to risk changing anything. We quietly, superstitiously, swapped back. The third, via Lennon’s impish improvisation that set up Keane... Then four, from Lennon himself: the roar from the Park Lane End could be heard in Holloway. Even the Gooners pulling one back and the inevitable fears of a shameful collapse failed to dampen our spirits... I had to savour this, watch Wenger, arms folded, pretending not to see his team squaring up to each other as they realise the enormity of the absolute, total and utter pasting they have received. Malbranque made it five – cue Que Sera Sera, over and over, scarves above heads: an atmosphere you could dish up using an ice cream scoop. 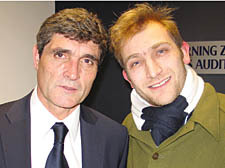 I spoke to Juande Ramos afterwards, and in front of the press he was calm, praising his players as the “architects of a victory through their perfect performance”. It was only in the corridor later that a small grin spread across his chops, and I heard him murmur in Spanglish that it’s nights like these that make football special and in turn make life worth living. So we put that one to bed – no derby win since 1999, but bragging rights are ours for the foreseeable. The High Road was rocking well into the wee small hours, as was my local in Dartmouth Park as fans from NW5, unable to sleep, gathered to convince each other that the historic thumping we had just witnessed was not simply the most exquisite dream. After having to find solace in moral victories for so long, this was a night to savour. One to savour for a very, very long time.